I had a great time at the State of the Map Conference in Manchester,UK. As usual, it's great to finally put faces (and voices) to names/typing. 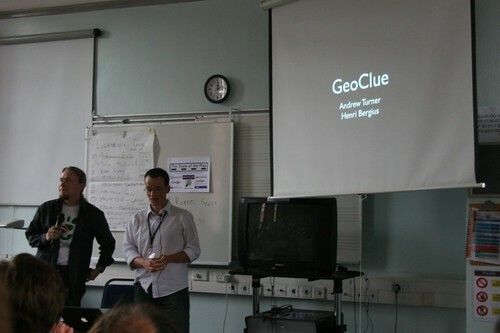 Henri Bergius and I gave a talk about GeoClue - the slides are here. In particular, we tried to make the case for the application of open geospatial data for location-based systems and a common framework that we are developing currently on the Maemo Platform, but applicable to any mobile or desktop system. As Mikel pointed out, OSM sometimes seems like it's on the edge of disaster, and other times, like this weekend, that it's definitely going to succeed. Overall, I got a reinvigorated surge of excitement about the project, and also some face-time to discuss details on bits and pieces to work on and add what help I can. Specifically, Schuyler and I talked about better spatial storage and access to the Ways with possible future benefit of moving to PostGIS and queries. Henri and I pitched our concepts on MaemoSurveyor - an online/realtime OSM collection and editing utility. We also talked with other devs working on similar ideas. The biggest 'take-away' was that OpenStreetMap is beginning to consider it's future as it moves from primarily collecting to instead correcting data. Therefore, mobile devices can be particularly useful when you are viewing the current map and can make corrections - or at least annotations - as you walk around an area. Also - I was surprised to hear very little about Asia and nothing about Africa, Australia/New Zealand, and South America. The project is definitely Euro-centric, with mention of the US (not even all of North America). That's definitely a reflection of the current user/developer base and effort. But I think OSM is getting to a point that it would very much behoove them, and the world, if they start trying to reach out to the broader world and including them in the general discussion and consideration of OSM. I'm looking forward to the quick spurt of activity that will happen from all the discussion at SotM as well as the long-term continued, exponential? growth of the project.